This month, in honor of Valentine’s Day, we are sharing love stories. We’re kicking things off with a two part series from Aden and his fiance, Josh. Yesterday we heard from Aden, today we get Josh’s side of the story. If you have a love story for the Keshet blog, let us know! We’d love to hear from you! Celebrate all kinds of love with our queer Jewish Valentines! 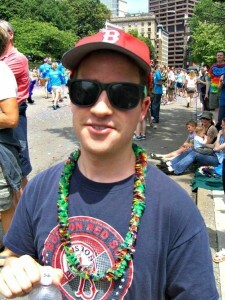 Josh at Pride in 2012. I began by going to Keshet events and meeting guys on OKCupid. There were some nice guys I met, but nothing clicked. During one Keshet Shabbat, I chatted with another guy about our Jewish and spiritual journeys and felt something between us… he left before I could get his number or name. Months later we reconnected and agreed to meet in Cambridge. The date was a long walk along the Charles River from Cambridge to Copley Square in Boston. We could not stop talking with each other. Sitting on a bench on Copley square he leaned in for a kiss on the cheek. I felt nervous. This was the first time someone felt that close to me. I didn’t know what this would lead to, but I felt something special. 8 months later, I went up to his home and noticed something was off. He was nervous and out of character. 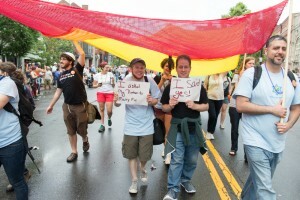 The next day we went together to help Keshet set up for Boston Pride 2014. I was excited and nervous to meet Jim Henson, my supposed new puppy. When we arrived, my friend Adam from high school was there. Not totally out of the ordinary, I knew he was going to Pride but I was confused as to why he was spending so much time chatting with me. I knew he had to go to help someone set up and then go to a wedding. But anyway, I was meeting a puppy, what did I care? Then, he gave me a TARDIS box with a “Time Lord” ring in it. He told me how much he loved me, my family, my friends, and my Jewish commitment. And, he asked “will you marry me?” I said yes. Josh & Aden at Pride in 2014. It was quite a day. Aden told me he had to do it on Pride because it was a meaningful day to me. Two years prior I had just come out. To think that two years later I was engaged at Pride is amazing. Aden put so much thought into the day which shows his love and care for making meaning in life and understanding me like nobody else. I love you Aden, and I look forward to spending each and every day with you.